After distinguished professional service to local patients for nearly a quarter of a century, Mr Plumley served in retirement as a member of the League’s general committee. In his final days he was cared for at the Irvine Unit. 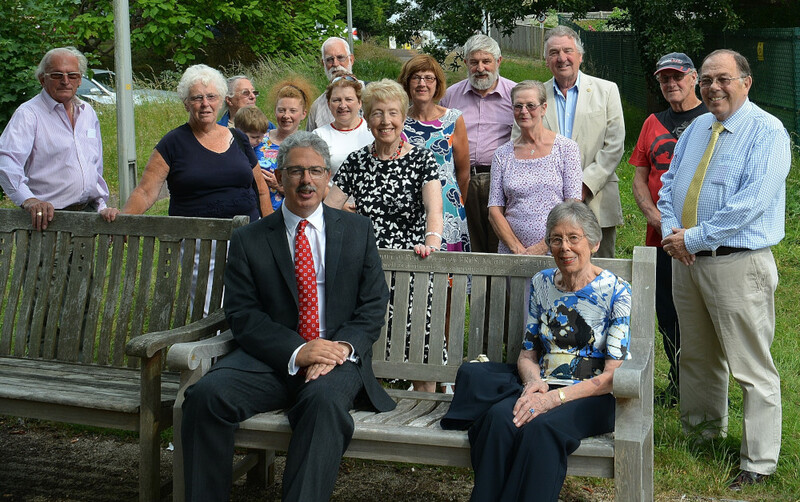 The memorial garden and purpose-made seating bench were funded by the League. Members of Highwoods Preservation Society’s work-party helped clear and plant the garden in 2015. At the brief gathering on Saturday, August 26th, Mr Plumley’s widow, Diana, and his son, Marcus, met League Chairman Cllr Stuart Earl and committee members together with Highwoods Woodland Warden Alan Dengate and fellow volunteers. In reply, Marcus Plumley regretted that his brother, Julian, had not been able to be present. He recalled that his father was general surgeon at Bexhill Hospital for 24 years. While not a keen gardener, he enjoyed DIY and would have appreciated the effort which had gone into the creation of the garden. The garden on the Holliers Hill side of the Irvine Unit has been designed to complement the Millennium Garden created by the League in 2000 on the west side of the building for the enjoyment of patients staff and visitors. Patients were sitting out in the sunshine while the photo-call was taking place. A framed citation explaining Mr Plumley’s service to the hospital will be placed in the Irvine Unit.